Jadera haematoloma on the the inflated fruit of balloon vine, Cardiospermum halicacabum, in Davis, CA. Photo by Scott Carroll. In our November image of the month, two soapberry bugs ask the timeless question: into how many baskets should you put your eggs? In many species of soapberry bug, there are two wing types: short and long. 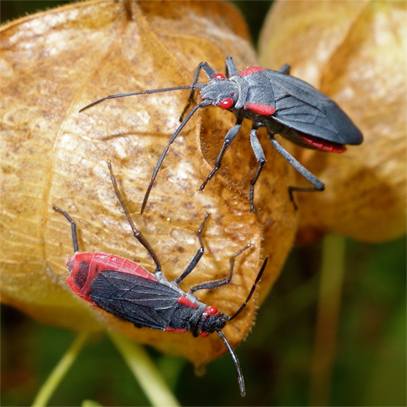 Short-winged ("brachypterous", below) soapberry bugs mature quickly and begin reproduction early, but cannot fly. Long-winged ("macropterous", above) soapberry bugs can fly and seek seedier pastures if food is scarce, but they take longer to mature. If you were a soapberry bug, which wing type would you have?